Democrats who do not want Trump to make America great again are putting his entire administration and all of America under siege with Alinsky tactics designed to stop Trump from taking action. They say they are impartial and unbiased, but that bald faced lie earns them five Pinocchios. The “Very Fake News” of the leftwing media is not just dishonest reporting, not just twisting the facts to make Trump look bad or appease their followers. They are actively using Alinsky tactics to distract, defame, demoralize, and immobilize President Trump and the Republicans. If you haven’t read them then you should so you can understand the purposeful actions of leftwing radicals. Alinsky’s “Rules for Radicals” is an instruction manual akin to Hitler’s “Mein Kampf” on how to disrupt and overthrow the rightful government in order to gain power to eventually install a socialist dictator. 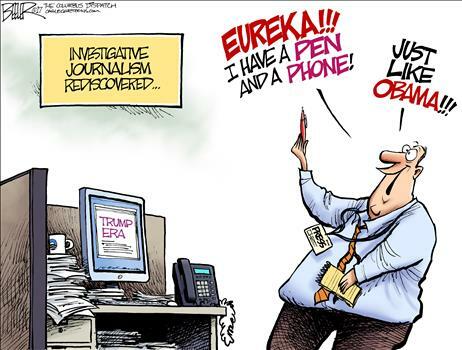 The Democrat media’s purpose is not to report the news, but to warp the news to detract from Trump’s achievements, and cause so much mayhem that his people are inundated with chaos keeping them from moving forward. The leftist media has posted numerous false stories meant to make Trump look like he is not keeping his campaign promises as he is and to make his Cabinet and those who assist him appear to be lying. They publish lies with which the administration either must contend, or allow the leftist lies to stand as the Bush administration did that allowed Democrats to warp the Bush years to be a calamity in people’s minds. The Donald already knows the result of not countering liberal lies that resulted in people stupidly electing an America hating racist Moslem to be leader of the free world. Contrarily, the Democrat media ran interference providing cover to Obama as he proceeded to tear down America and set the world on fire. New York Times published a story about Russian trollers off the American coast close to naval bases as if Putin had just put them there to either threaten or get in close contact with Trump. The truth is they have been there for the past fifty years. Wall Street Journal reported that Intelligence agencies are withholding intel from President Trump implying that they don’t trust him or believe him to be incompetent. The truth is that 99.99% of what they uncover is never reported to the President because they are not that important. AP posted a story that Trump will be using the National Guard to round up immigrants. First off, the President does not control state troops, and second, they are not necessary to round up illegals, not legal immigrants. CNN claims that Flynn was fired for asking the Russians to hack Hillary and the election. First, the reason Gen. Flynn was let go was not revealed, only that he had misled VP Pence in his interview. Second, the Russians had nothing to do with hacking the election. Democrat’s speculations that WikiLeaks got Podesta’s emails from Russia are bogus and virtually no one’s vote was influenced by what was in them. Democrats enact a bill to deny the President access to the nuclear codes. This is actually true – and a testament to the stupidity and insanity of the leftists in their efforts to restrict Trump’s actions. So long as Trump’s people are busy putting out media fires, which are nothing but arson, they are being kept from conducting the important business of repairing the nation. In addition, protesters are tying up law enforcement by operating like terrorists. They get a group that acts peaceful to provide cover for the radicals who attack. This “Resistance” movement is designed to cause injury and destruction while claiming to be peaceful demonstrations. These are Hitlerian Alinsky tactics used by Nazis and Islamic jihadis. Leftists claim that Trump’s travel restriction was rightfully denied by a federal judge as unconstitutional. But the judge did not quote the law in his judgement, only his personal opinion based on innuendo and supposition. Trump could legally ignore his stay on the EO, but Republicans convinced him to make another, which will also be negated using the same illegal leftist logic. Liberals claim Trump’s Cabinet to be rife with corruption and Obama to have been without scandal, but that is simply ignoring the Obama administration’s lies and corruption including; Eric Holder, Susan Rice, Loretta Lynch, Jon Koskinen, Lois Lerner, Jeh Johnson, and Hillary Clinton. It is up to the voting public to stay informed and not rely on those who seek to deceive them. A Free Press is necessary to the success of Democracy, but that doesn’t mean they are free to lie without challenge. The 1st Amendment guarantees your right to speak, not your right to be believed. This entry was posted in Politics and tagged Adolf Hitler, Democrat propaganda, Democrats shut down Trump, Donald Trump, Immigration, Islam, Leftist protests, Leftwing media, Liberalism, Saul Alinsky, Terrorism. Bookmark the permalink. Eileen, I heard the same thing. Later on, I heard that the problem was a confusion amongst the districts at the border. Apparently, there are some agents who agreed with the last administrations handling of border crossers and are having difficulty making the change. I imagine they will find their new jobs, whatever they are, most rewarding. lol. You mean the same alinsky that dedicated that very book to you know who? You mean the same alinsky who hillerybillery hung out with? You mean the same alinsky who was probably very influential in shaping the opinions of the weather strip underground kill squad? Well, I don’t like him at all. Probably no real, normal American does. Let’s run these scum out of our press, our institutions, our universities and schools and return to those ideals which made America great before. “One nation, under God, indivisible, with liberty and justice fot all.” God bless and God bless America!! !